The past is almost always seen in black and white. It is not always appreciated that colour photography has existed for more than a century. Various factors have conspired together to ensure that the public perception of colour photography is that it is a relatively recent invention, certainly within the last half century or so. 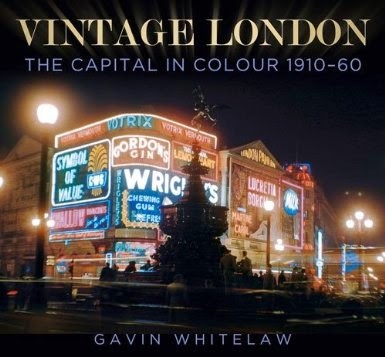 Over the past twenty years I have been collecting original colour transparencies and my latest book, Vintage London: The Capital in Colour1910-60, draws on that source to illustrate, in mostly unpublished images, London from before World War One through to the end of the 1950s. A London that has vanished into that country where they did things differently – the past. The most recent images in the book were taken almost 55 years ago and the oldest way beyond living memory. The 1920s and earlier have been an era that has almost never been captured in colour. A few images are known but a large collection of Autochromes came to the market last year and I was fortunate enough to obtain them. Amongst which were a number of colour images of London taken in 1928, a few of which are included in the book. These show a city that the Victorians would have known. As far as I am aware this is the first book to illustrate London in the half century from 1910 to 1960 in colour, a city seen through the eyes of photographers who put colour film into their cameras when it was tremendously expensive to do so and who had the foresight to allow us a glimpse into the past that our fathers, grandfathers and in some very rare cases great grandfathers knew.